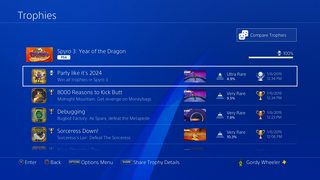 With the 117% completion mark on Spyro 3, Perfect Dragon is sated and sinks once more 'neath the waves to swim unseen to her off-shore island retreat, where she will stuff herself with delicious foods and relax on a bed of pillows. Domo arigato, Perfect Dragon. Rest well, brave heroine, 'til your time comes again. Some things I remember being extremely hard were easy, some things I remember being incredibly easy were near-impossible. The Speedway ring-races alone nearly put me through the five stages of grief each. I was eventually speedrunning them, by which I mean the grief stages, not the races. "NOOOO DAMN IT WHY DOES THIS HAPPEN I'M SO AWFUL oh well I accept my fate." in under thirty seconds and then push 'retry race'. Still, I'm not sorry I picked this up. I love these games and I'm really feeling like someday I need to play the rest of the series. How are the controls? I never played Spyro games after the first 3 because on 4 everything responded just enough slower that it threw all my reflexes off and felt wrong to maneuver in. Is the movement nice and tight still? 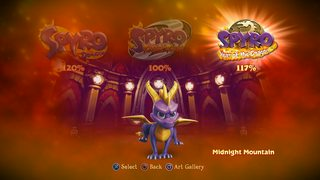 Ridiculously responsive, but at full speed Spyro has a very wide turning radius that often threw me. Specifically, it threw me off cliffs a few times until I got used to it. Whups. And there's nothing like when you go over a cliff, hit your hover, and it's just not enough to get back on.